The email arrived Saturday evening, just as it does every Saturday this time of year. The missive from Darren Rogers, senior director, communications and media services for Churchill Downs, is a detailed listing of the points leaders for the upcoming Kentucky Derby—this year presented by Woodford Reserve (G1). Sitting at the top this week—co-joined by Noble Indy—is Audible, the clear winner of the March 31 Xpressbet.com Florida Derby (G1). His 100-point-earning performance, as impressive as it was, however, wasn’t the “buzz-worthy” story of the day. Halfway around the planet the Coolmore team’s Mendelssohn jumped into the Derby picture with his off-the-screen 18 1/4-length score in the UAE Derby Sponsored by Saeed & Mohammed Al Naboodah Group (G2). He picked up the same number of Derby points as Audible, assuring himself a spot in the starting gate for the May 5 Run for the Roses. That win pretty much means three of the 20 stalls come Derby day will be filled with horses trained outside the U.S.
Churchill Downs has already devised the European Road to the Kentucky Derby, which is an invitation that looks to have been accepted by the connections of Gronkowski, the Kentucky-bred who won the March 30 32red Burradon Stakes at Newcastle. Churchill Downs also has a Japan Road to the Kentucky Derby, with the connections of Ruggero holding a golden ticket if they so choose. Mendelssohn’s score, while not named, could essentially be the Dubai Road to the Kentucky Derby. Churchill Downs’ branding of the Road to the Derby has been pretty sharp. 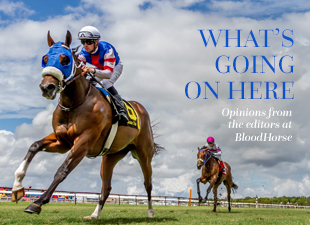 Trainers chase and fans follow Derby points rather than graded stakes earnings, with the weekly updates pushing the Derby name every weekend. Outreach to Europe and Japan has helped the race gain entry into international markets. This move is good not only for the company but for the sport—interest in the North American racing product is what everyone in the business is clamoring for. And fans in Asia and Europe do at least one thing better than we do: wager. Mendelssohn’s win in the desert has sparked the imagination of many. We can’t wait to see what he can do upon his return to the U.S.
A horse attempting to win the Run for the Roses after racing in Dubai was a novelty a generation ago. Sheikh Mohammed’s quest began in earnest in 2000 with China Visit (sixth at Churchill Downs) and Curule (seventh). Others have followed. Last year Thunder Snow came to the Downs from Dubai and was a well-backed 16-1. The day was not one of his better ones as he bucked soon after the gates opened and was pulled up early under Christophe Soumillon. He’s managed pretty well since, winning last year’s Prix Jean Prat (G1) and the Dubai World Cup Sponsored by Emirates Airline (G1) a few hours after Mendelssohn’s score. Mendelssohn, bred and raised in Kentucky by Clarkland Farm—was clearly heads and tails above the rest of his crop as a yearling. At least that’s what the market thought of him as M.V. Magnier had to flash three fingers—one for each million—to the bid spotter to land buy him at the 2016 Keeneland September yearling sale. Last year at 2 Mendelssohn made the journey from Ireland to California and clearly won the Breeders’ Cup Juvenile Turf (G1T). Having wintered in Ireland, he’s made the journey to Dubai and delivered a corker. That leads us to believe he’s a pretty good shipper. The thought once was intercontinental travel required months of recovery time. The learning curve isn’t nearly as steep these days, and its of time before a horse off a victory in Dubai can win in North America “off the plane.” That time could be now.